Need to Vent! — Movie Reviews with a Twist: FRENCH FRY CRINKLE CUPS!!! Chefs Catalog (The Best Kitchen Starts Here) has a "NEW" item that defies belief. On page 21 you will find, and I quote verbatim: "Porcelain renditions of the paper French fry cups popular with street vendors in Brussels make a big impression at the table. 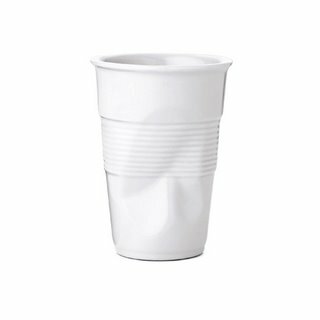 Our tall cups are tapered to hold a cluster of pommes frites and include a side crinkle that furthers the paper illusion and makes it easy to hold at parties, too. Oven-, microwave- and dishwasher-safe. Made in France. Set of two: $24.99"
A penny shy of twenty-five bucks for two "porcelain renditions" of a paper cup? You gotta be kidding, although I will admit that the "crinkle" is a nice touch. If this really does impress your friends, I would guess that you are a card-carrying member of the Texas Lyceum. going to france in 2 weeks. makes me want to add to my usual "thievery" items like beer mugs - if only I eat in some place uptown enough to serve me in a $13 imitation paper cup.